Learn how to defrost a freezer fast. No one wants to spend their days melting ice and cleaning up but sometimes it’s got to be done. While newer frost free models are great at helping us avoiding this tedious chore, they are a factor in freezer burn. The way auto-defrost freezers work is to raise the temperature so that any ice build up melts - only problem is that means your food can start to thaw and refreeze, too. Learn more about food refreezing here (and why you should keep a bag of ice cubes in the freezer.) So, if you want to get the maximum benefits from your freezer you are better off with a manual defrost model. Watching the ice melt is a sign of victory! Let that freezer defrost. The key to avoiding defrosting time is having a good seal on the door. A good seal keeps moisture out of the freezer. Moisture that gets into the freezer turns solid, forming ice on the walls and shelves. Exactly the stuff we have to melt and get rid of. I’ve become quite an expert at defrosting the freezer after living in an apartment with a bar fridge. The freezer inside the fridge did not seal because that freezer was the cooling unit for the whole fridge. If I tried to freeze ground beef the milk in the fridge went bad. In two months time it would look like a frozen cavern, with frost built up so thick we'd scrap our knuckles reaching for the ice cube tray. So, once a month we had to defrost that freezer just so we could keep ice cubes in it without bloody knuckles, literally. Seriously, I wish I was exaggerating. Hopefully what I've learned will save you some time. These simple steps cover everything you need to know. If your thawing a unit inside of a fridge then remove the food from the fridge too. If your fridge has a different door and separate controls allowing you to turn off the freezer while leaving the fridge running it’s safe to leave food in the fridge (and I would have been jealous back when I lived in that tiny apartment). Don’t even try defrosting a freezer with it running, it’s a drain on electricity and on you (believe me, I've tried - because I didn't want to unpack the fridge). So turn off the power, unplug it and get ready to roll up your sleeves. Now you can leave the door open. Towels can go into the freezer on the bottom and on shelves to help absorb the ice that defrosts. Also put towels on the floor tucked against the freezer because water is likely to drip to the floor. Use the bucket to ring the towels. Or if you have a lot of ice melting grab a clean mop too. I used the mop to keep the floor around the freezer dry and rags to sop up the water on the bottom shelf. If your unit has a tray under it, as commonly found in older refrigerators with freezers on top, make sure to keep emptying the tray as the ice melts. Dump it in the bucket or in the sink. I know many freezers have drain plugs, but if it's not plumbed to a drain it's not gonna help you. Generally at this stage you wait for the ice to melt and keep mopping up the water. If you don’t have a lot of ice buildupthis is certainly the easiest method to defrosting. Or you can speed up the process using the methods below. Too much ice and not enough time? There are four ways to speed up the defrosting process. Take a pan and fill it with water, get it nice and hot on the stove or use a bowl in the microwave. Place the hot water inside the freezer and close the door. After about 5 minutes remove the pan or bowl and reheat then put it back in the freezer. Continue until ice is melted. I personally hate the hot water method of defrosting the freezer. I find that the ice under the hot water melts first and the pan or bowl sticks to the ice as it cools off. It’s annoying to come back every 5 minutes and it doesn’t seem to help the ice melt that much faster. Set up a fan outside the freezer with the freezer door propped open so that air circulates faster. More air flow will help the ice to melt faster. However, you might not have a fan that you can angle properly and if your thawing a unit above a refrigerator it might not be worth the effort. Lets think about this for a second. The goal is to turn ice into water. Blow driers and water are not a good combo. This is not the safest method. It is not recommended for safety reasons. That said I’ll admit I’ve tried it. At first glance it doesn’t seem to do much. But what happens is the heat goes to the back and then up. So after awhile the ice on the top will defrost away from the freezer, however with thick ice you most likely won’t see this. Instead large pieces of ice just start to break off the top. In my experience this method along with the scrapper method and lots of towels is the fastest way to defrost the freezer. Scraping the ice is probably the most common way of speeding up the process of defrosting the freezer. But we have to make sure to do it safely. And that, my friend, means no sharp objects. There are two reasons for this. First you could hurt yourself. Second you can scrape or puncture the cabinet of your freezer. Well, it doesn’t sound like a big deal, puncturing the stuff behind the freezer cabinet could cause a leak and make your whole freezer useless. It’s not worth the risk. Plus scratched areas are more likely to rust and no one wants rust near their food. A dull object, like a plastic spatula or spoon, works better. Think of it less as ‘scrapping’ and more as ‘assisting’ large chucks of ice to come out before they melt. This method works well with the blow drier because as the ice starts to defrost off the wall or ceiling you can get the spatula under that and take out larger chunks. Alright, you have patiently waited or mercilessly melted all the ice. Don't just throw stuff back into your freezer, there is a bit more to do so you can smile every time you open the door. Until that darn ice builds up again at least. Use a mild detergent or 3 tablespoons baking soda in 1 quart of water to gently clean the freezer while it’s already empty. And do not rub oil over your freezer like some sites suggest, because over time even at cold temperature that oil will go rancid. Make sure the freezer is dry before you turn it on or you’ll be starting to build up ice again before there's even food inside. Turn the freezer on, set the ideal freezer temperature for your needs, between 0F and -10F. 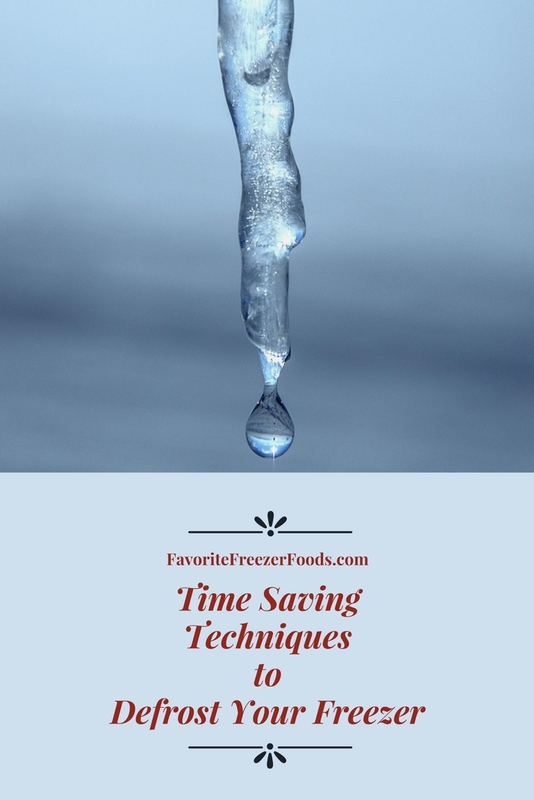 I would wait about an hour before adding food that is still frozen, longer for refrigerator temperature food. And never freeze food while it is still warm - this can melt other things and even add to the dreaded build up of more ice. Check the foods you have before returning them to the freezer. Anything too old or freezer burnt should be tossed out. While we are on the topic there is a myth I would like to dispel. Myth: Frost in a freezer contributes to freezer burn on your food. Truth: Frost in the freezer usually means there is an air leak. However, foods that are properly wrapped in moisture-vapor proof freezer materials will not develop freezer burn simply because the freezer doesn’t seal properly. Any meat that has thawed needs to be cooked before it can be frozen again. 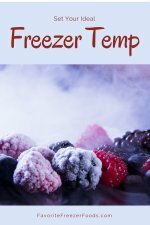 Learn more about how to refreeze food if you're not sure. Put like items together so they are easy to find. There's a method to organizing your freezer contents. Put raw meats on the bottom, cooked above that, fruits and veg higher and things that can't contaminate other foods such as baked goods on the top. While repacking the freezer I highly suggest you add every item to your freezer inventory sheet. This way you know exactly what is in there. 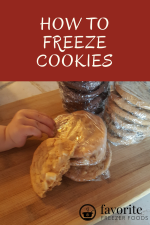 You can get a free printable freezer inventory sheet as a gift when you sign up for the Favorite Freezer Foods Ezine, a newsletter full of tips and tricks about freezer cooking and freezer meal recipes.